In simple lyrical rhyme, a mother expresses her love for her unborn child. With lush illustrations by Jing Jing Tsong. 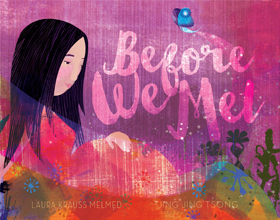 "Laura Krauss Melmed delivers a beautiful salute to the bond that exists between mother and child in Before We Met. Jing Jing Tsong’s breathtaking digital collage illustrations feature an evocative palette of violets, purples and blues—the deep hues of a night sky—to create a magical backdrop for a mother’s musings. The phrase “before we met” serves as a refrain in the book’s rhymed lines, turning the text into a lullaby: “Before we met, I dreamt I felt the beating of your heart. Before we met, I promised you I’d love you from the start,” the mother tells her newborn. Soon night gives way to day and a sun-drenched gardenscape filled with flitting birds and blooming flowers. This celebratory scene, signifying birth, is the perfect endnote for Melmed’s gorgeous, impressionistic story-poem." "An ode from an expectant mother to her unborn child. Written in first person, rhyming verses find a mother sharing her hopes and envisioning her new life after she births her baby. Each verse begins with the line "Before we met, I dreamt…"as the mother imagines meeting the child she is carrying in her womb. Melmed offers vivid imagery of the baby's features: skin that is "softer than a flower" and a cry that is "sudden as a shower." On the last three pages the mother meets her baby face to face. Here the mood transformsfrom introspective to celebratory....Melmed captures the unconditional love an expectantmother has for her baby. The book's soothing rhymes are an invitation to repeated bedtime readings. Tsong's ethereal illustrations echo the book's dream analogy, depicting the mother with long black hair and possibly Asian features.The colors begin with blues and purples as dark as night. Page by page, the colors lighten with splashes of shades of red and orange before exploding intoa sunrise..."
"In this whimsical story, a new mother reflects on the time before her baby was born. Each page hosts a brief sentence describing her anticipation in the form of dreams: “Before we met, / I dreamt we danced / to songs a songbird wrote”; “Before we met, / I dreamt I felt / the beating of your heart.” Complementing the words are Tsong’s richly textured illustrations. The digital collage artwork exhibits a layered, stenciled effect that is thick with color and light, as it depicts scenes from nature. Gossamer dragonflies, broody birds in their nests, mares with their foals, turtles, sea horses, and myriad other parent creatures foreshadow the arrival of the human baby, who is (naturally) a dream come true. The gentle, poetic text makes this soothing book well-suited for nap- or bedtime reading. While its simple message of love will be appreciated by all, it will connect strongly with new parents in particular."